Depending on the motherboard you have purchased and how you plan to use your computer, you may need or want to install one or more expansion cards. You'll need expansion cards if the motherboard itself doesn't provide some essential functionality (for example, if it doesn't have integrated audio or video). You may want to install expansion cards if the motherboard does provide all the essential functionality, but an external card would do it better (for example, if you're a gamer and the motherboard's built-in graphics would be inadequate to run your games properly). As with any other component in your homebuilt computer, you should make sure that the cards you are about to install are compatible with your motherboard and with the operating system you plan on installing. The most basic factors to consider are whether the cards will fit (that is, does your motherboard have slots to accommodate them), whether they're compatible with your operating system, whether they're compatible with the applications you want them to run, and how much power they consume. Compatibility becomes especially important when selecting PCIe cards because the specifications and the physical slots for the different versions of PCIe are not compatible. So be especially careful that your motherboard is capable of supporting the cards you have selected before you attempt to install them. You should also check your motherboard's manual to see if there are any motherboard jumpers or BIOS settings that you have to set. Usually there won't be, but it's a good idea to check anyway. You may need to disable the integrated peripherals in BIOS to use add-on cards. Even though this would be something you have to do after the computer is assembled, it's good to know it in advance. You may, for example, have to use your motherboard's integrated video for first boot in order to enable an add-on video card. Knowing that before you try to boot the computer for the first time can save you frustration later. 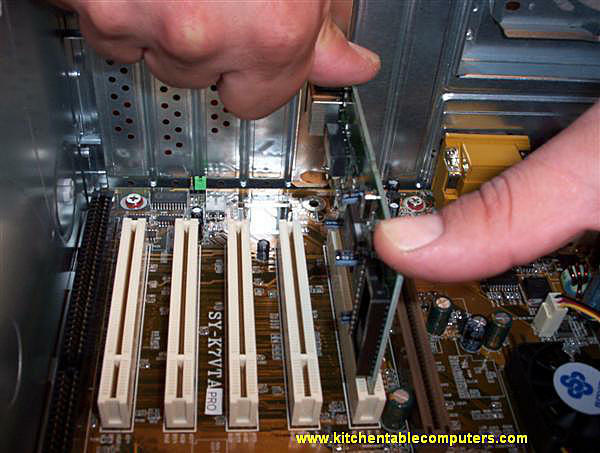 As is the case with any computer part, always be sure to observe anti-static precautions when handling or installing expansion cards. Nothing is quite so depressing as totally destroying an expensive card because you didn't take anti-static precautions. Use a good anti-static kit whenever handling sensitive electronic components. Like RAM, expansion cards and slots are keyed. They have little notches with corresponding tabs in the slot that are designed to prevent you from installing a card that's not designed for the slot. Don't try to force the card. If it doesn't fit, it doesn't fit. If the motherboard manual says that a card should fit, but it doesn't, then check the other slots on the board. Maybe you tried inserting it in the wrong slot. If none of the slots will accept the card, then the card and the motherboard are incompatible. You will have to exchange either the expansion card or the motherboard. 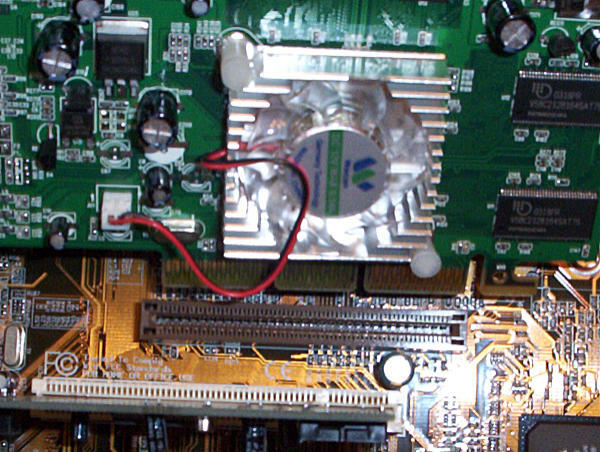 The picture shown here is of an older AGP video card being installed in its slot. Note that the slot is set back from the rear panel of the case and from the PCI slots. The distance from the rear access ports is another method used in addition to the various ridges, tabs, and so forth to help prevent you from installing a card in the wrong slot. In a nutshell, expansion cards should fit easily into slots that are obviously designed for them. If they don't, then they are not compatible. Expansion cards, like RAM, are pushed straight down into their slots, like the network card being installed in this picture. If those slots don't look familiar to you, that's because they're PCI slots in an older motherboard. Your motherboard may or may not have any PCI slots at all. Some new motherboards have one or two PCI slots for legacy cards, but PCI is slowly fading into history. When multiple slots of the same form factor are available, it may or may not matter which cards are installed in which slots. It usually doesn't. But check the instructions for both your motherboard and the expansion card just to make sure. Some cards may have additional connections that have to be made, such as the cable that connects a CD-ROM drive to the sound card, or a power connector for some high-powered video cards or audio break-out cards. See the card's documentation for detailed instructions. Once you have determined that your expansion cards are compatible with your motherboard and have deciding into which slots the cards will be installed, actually installing them is simple. Place the computer on its side so the slots on the motherboard face up, carefully align the card in the slot perpendicular to the motherboard (that is, straight up, because the computer will be on its side), and firmly but gently push the card straight down into the slot until you feel it "pop" into place. If it doesn't fit, double check to make sure that the slot is the correct type for the card. Don't break out a hammer and pound it in. If it doesn't fit, it doesn't fit. Finally, secure the card into place. If the cards are not properly secured, they will creep out of their slots over time. The mounting system also provides an additional chassis ground on some cards. 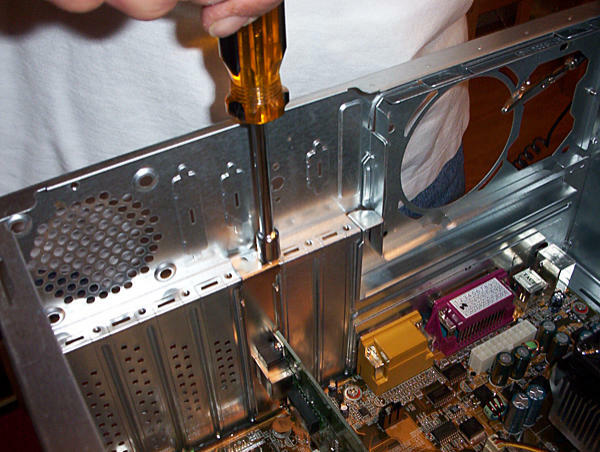 On some computer cases, like the one in this picture, expansion cards are secured by screwing their metal brackets into the screw hole over the expansion slot opening. The screws may be either Phillips head screws, Torx screws, slotted screws, hex screws, or some combination thereof. Any decent computer tool kit should cover all of those possibilities. Many newer cases use various kinds of brackets or clips instead of screws to secure the expansion cards. Usually, it's pretty obvious how the hold-down system works just by looking at it. But if you can't figure it out, check the manual that came with the case. There may also be little explanatory arrows or other graphics stamped into the case or on a label attached to it. It's a good idea to save the slot covers to cover the holes in case you ever decide to remove the card. Using electrical tape to cover the empty slots looks tacky and unprofessional. Now let's proceed to the next step, Installing the Hard Drives.